INCA CRC-227 radiant heat neutralizing membrane is a single component, water based acrylic elastomeric. This roof material incorporates heat dissipating properties to provide a neutralizing barrier against solar heat gain in the summer and preventing some heat loss from inside the structure during the winter. INCA CRC-227 is designed for use on metal, concrete, asphalt, EPDM and rubber cap sheet roofs. A 15 mil DFT roof application of INCA CRC-227 will remain durable for a minimum of 10 years in normal service. This class leading longevity is due to the advanced coating science that neutralizes the solar heat that would otherwise penetrate the roof and building. The elimination of solar heating relieves the membrane from most life shortening heat stress; and it eliminates the same heat stress from the rest of the structure. The neutralization of the solar heat normally absorbed by the roof also reduces A/C demand and the associated costs of that demand. 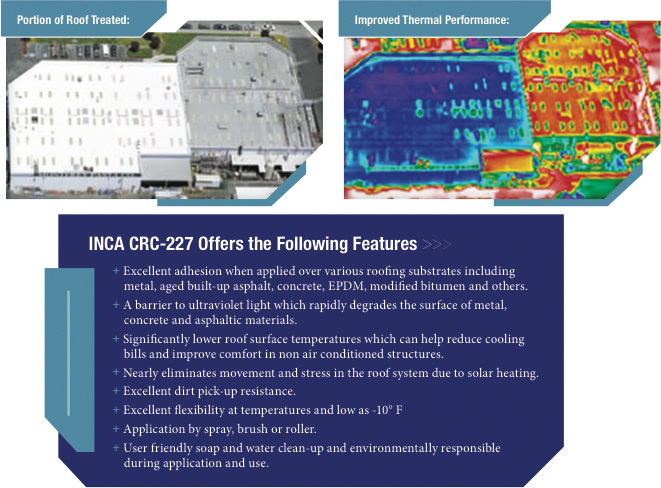 The thermal neutralizing effects of CRC-227 remain constant throughout its useful life; and can be renewed periodically to extend the roof's useful life into multiple decades. Surfaces to be treated with INCA CRC-227 must be clean, structurally sound, and dry. All surfaces must be cleaned thoroughly and free of all efflorescence, dirt, or debris at each stage of application. Rusted metal surfaces must be also treated with INCA RCMP or PS-100 direct-to-metal primer prior to application (See product specification). Concrete surfaces should be treated with INCA MSCB Multi-Surface Primer (See product specification). Asphalt, EPDM and rubber cap sheet surfaces may need special primers, depending on condition. INCA CRC-227 may be applied by brush, roller or spray. For best results use airless spray equipment that delivers at least two gallons/minute at no less than 2000 PSI. Use carbide or tungsten steel reversible tips ranging in size from .027" to .031". INCA CRC-227 should not be reduced by water or any other solvent or thinner. Recommended rates of coverage and dry film thickness vary by substrate, surface use, and environmental conditions. Application of two or more coats to achieve an average minimum of 15 mils or 52 SF/gallon is required for optimum product performance in roof service. Because this product is water based, application shall not begin during: inclement weather; when precipitation appears imminent; or when freezing may occur within 24 hours. CRC-227 also requires at least two hours of full sun drying time before it can withstand exposure to heavy dew or light rain. No ponding at all within 48 hours of application. Applications to hot surfaces should be cooled to below 135°F (57°C). On dark or hot surfaces warmed by external radiant energy, this may be accomplished by the application of a light mist coat (250sf/gal) of white INCA CRC-227, prior to the specified two coat application of the Heat Neutralizing Membrane. Application to new, hot mopped tar or other petroleum based materials must wait until after the surface has fully cured, usually up to 90+ days. New metal surfaces must be free of grease and oily residues. Wash with vinegar, TSP or other detergent. Rinse thoroughly. Designed for use on metal, concrete, asphalt, EPDM and rubber cap sheet roofs.